Today's card was made using Taylored Expressions Sketch Challenge #156. I used a really fun stamp set - Chillax. 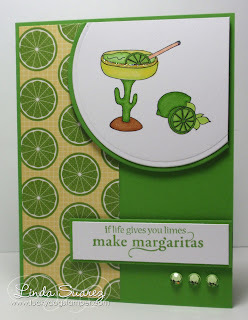 Mmm, makes me want a margarita right now! Ack, Linda this is FABULOUS!!! You made this sketch look easy with your adorable card. After this week, I need one of these. LOL! Your paper couldn't be more perfect. Thanks for playing along with us this week! I am an empty nest mom and wife who loves stamping, scrapbooking and all things paper! I also love family research, running, hiking and golf! My best day is a great hike with my husband and dog Marley!